Mavrides Anthony - Ballas, Pelecanos & Associates L.P.C. Anthony Mavrides is a Senior Associate and Head of the firm’s Consumer Rights Group. Moreover, he assists the firm’s IP, IT & CT Group in cases regarding customs. Anthony is a member of the Athens Lawyers’ Society since 1988 and entitled to argue cases before all Courts of Appeal and lower Courts. A graduate of the Aristotle University of Thessaloniki Law School (LL.B. ), Anthony also holds a Masters of Law degree (LL.M.) from the University of Kent Law School, where he studied International Commerce Law. At "Ballas, Pelecanos and Associates L.P.C. 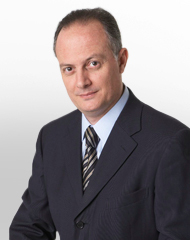 ", Anthony is heading the Consumer Rights Group, a field in which he possesses an excellent know-how, allowing him to litigate or negotiate disputes involving consumer rights’ protection and product liability, while at the same time he advises for similar matters major automotive industries. Furthermore, Anthony has an extensive experience in litigating intellectual property rights infringement cases in both criminal and civil courts. He is also an excellent connoisseur of the European customs regime, knowledge that allows him to easily communicate with and assist competent custom authorities in recognizing and identifying counterfeits. At the same time, Anthony advises on high level multinational firms on various anti-counterfeiting issues. As a reward of the high quality of legal services rendered by Anthony, he has been chosen to participate as lecturer in a training programme for Police & Customs officials in Estonia sponsored by the EU.